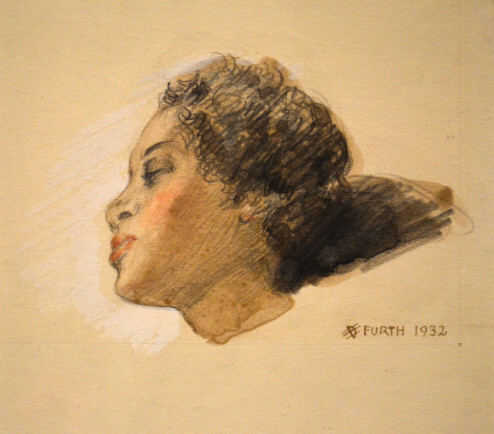 Colored pencil and charcoal, Signed "H Furth 1932" l.r. Site Size:5" x 5", Framed: 12 1/2" x 14 5/8"
Hertha Furth was born in Vienna in 1907 (bio 1967 American Artist Magazine) but passport records show her birth date as 1900. She studied with Julius Klinger in Vienna and Charles Martin (1884-1934) in Paris. She entered the US in 1929 and lived in New York City, where she was a noted designer for Bloomingdale’s. She held several patents for art related design. She illustrated books by Dr. William A Brams. Her work is featured in American Artist, January 1967 and 100 Watercolor Techniques by Norman Kent.